Cats new recruit James Parsons in action for Vic Metro earlier this year. GEELONG'S second selection in the 2015 NAB AFL Rookie Draft was Victorian wingman James Parsons. 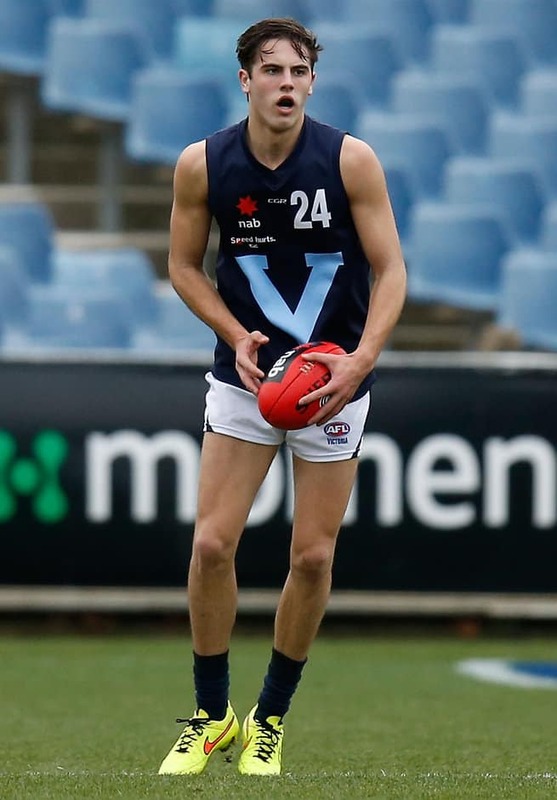 The 18-year-old, who was chosen with pick No.27, is askillful ball user who has been likened to Essendon's Martin Gleeson. Cats recruiting boss Stephen Wells said today was an exciting day for both the club and Parsons. "James plays mainly as a half-back or wing, shows outstanding run and is a good kick. We will look to develop his strength and consistency in our program," Wells said. Parsons is a versatile player and was a member of the NAB AFL academy and played with Eastern Ranges in the TAC Cup. Standing at 189cm, Parsons has played 29 TAC Cup games and kicked 21 goals over the past three years. He represented Vic Metro at the NAB AFL Under-18 Championships, and made his VFL debut with Box Hill against Coburg in July. Parsons was flagged as someone to watch in an article by AFL Media reporter Callum Twoomey in the lead-up to the rookie draft this week. "Parsons' outside run and skill level might be enough to see him get a chance as a rookie despite an up and down season," Twoomey said. "The NAB AFL Academy graduate has speed and carries the ball, and can kick the ball long and with penetration. "His physical makeup also makes him a player with promise, given he should be able to add some size if he gets into the system." Parsons was also profiled by Jourdan Canil on www.boundforglorynews.com.au as an exceptional outside midfielder with a penetrating kick. "Parsons’ best asset is his kicking. He is a long kick, and he weights it really well," Canil said. "Parsons has gone forward to effect this year. He’s been able to kick two or three goals on several occasions. "He’s not a lead up forward type, but he’s able to find space in general play. He reads the drop of the ball well and he can crumb."